Exol Two Stroke is a high quality, low ash two stroke oil. It has been specially formulated from the latest additive technology and base oil components to produce a low smoke, clean burning product. It is designed to exceed the performance requirements of API TC and is suitable for both premix and injector systems. 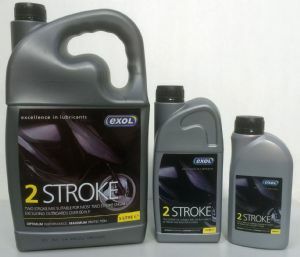 Exol Two Stroke is suitable for use in motorcycles of low to medium output and can be used in a variety of two stroke applications such as chainsaws, hedge cutters, go karts, lawnmowers and snowmobiles. performance requirements of API TC and is suitable for both premix and injector systems. applications such as chainsaws, hedge cutters, go karts, lawnmowers and snowmobiles. Always refer to the equipment handbook for mixing ratios and specification requirements.